Mary Jayne’s Railroad Specialties…and an airline? 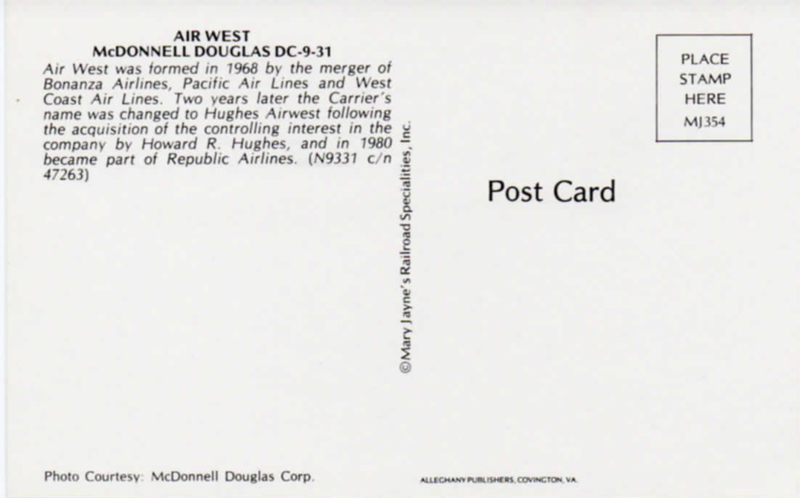 This is the lowest inventory number I have of the airline series that MJRS issued between the mid 80s or so through to the late 90s. The company was owned by Mary Jayne and John Z. Rowe of Covington VA. The MJRS company was incorporated, though, in North Miami Beach FL in 1973 and went inactive in 1999. Mary Jayne died in 2015 but her obituary doesn’t mention MJRS. It only states that she and her husband operated a land survey company. There’s an article in a railfan mag on the web on MJRS, but it’s stuck behind a $43 paywall. Passed on that. There is no inventory list of these cards on the web, as far as I know. This is MJ354 and my highest number is MJ1297, but this isn’t a continuous sequence. There are many holes in the numbering. Either I just don’t have all the cards (likely) or these cards, which changed publisher at least once, were part of a larger print run that included other subjects. This one was printed by Alleghany Publishers, Covington, VA. I hope the pinkish hue was intentional. The cards I have cover an amazing number of airlines and many, many aircraft. This group was a real find. 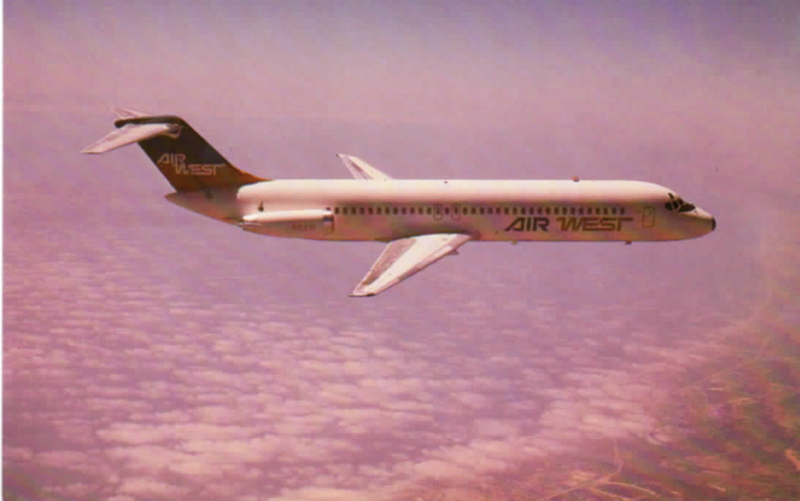 Posted in Existing photo processed by Bob Lawrence and tagged Air West, Alleghany Publishers, Bonanza Airlines, Covington VA, Hughes Airwest, Mary Jayne's Railroad Specialties, McDonnell Douglas DC-9-31, North Miami Beach FL, Pacific Air Lines, Republic Airlines, West Coast Air Lines. Bookmark the permalink. You are always finding the coolest stuff, Bob.